The Baseball Hall of Fame never has issued a clear statement about how voters should handle the steroids issue, until now. COOPERSTOWN, N.Y. — It came and went without much commotion Saturday, maybe because it looked more like bureaucratic bookkeeping than anything else. COOPERSTOWN, N.Y. (AP) — Barry Bonds, Roger Clemens, Sammy Sosa and Mark McGwire will have less time to remain eligible for the Hall of Fame ballot under changes made Saturday. Is this the best message to be sending to our kids? Really, is this the best we can do? Maybe the juicers can have their very own wing in Cooperstown. COOPERSTOWN, N.Y. – We used to have these talks, Frank and I, inside the Chicago White Sox clubhouse. The subject was taboo back in the days, but Frank Thomas was never one to keep his peace. 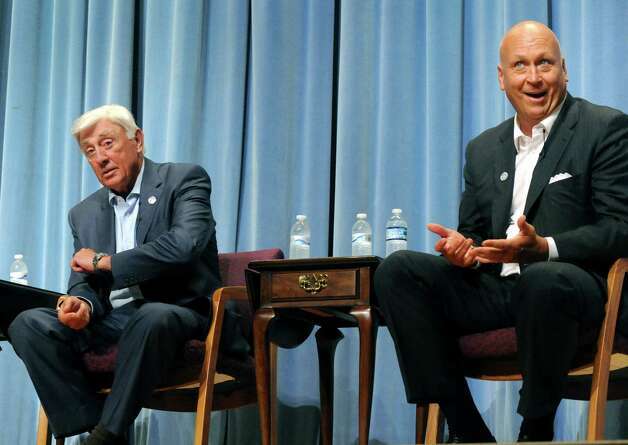 COOPERSTOWN, N.Y. — Hall of Famers Phil Niekro and Cal Ripken Jr. made a 45-minute drive east across two-lane country roads to Cobleskill-Richmondville High School on Friday for a talk with kids from seven area schools gathered in a jam-packed 720-seat auditorium. Hooton will be in New York on Thursday to unveil the results of a national survey funded by the Baseball Hall of Fame, the Professional Baseball Athletic Trainers Society and his foundation on steroid use among young people.